[PREP] Chris Brown, Rihanna Meets Up After MTV VMAs? The MTV VMA once again makes plenty of headlines. This sneaky audience was able to capture the moment when former lovers Chris Brown and Rihanna embrace. The singer who just won Video Of The Year for the song We Found Love, had just finished her performance. 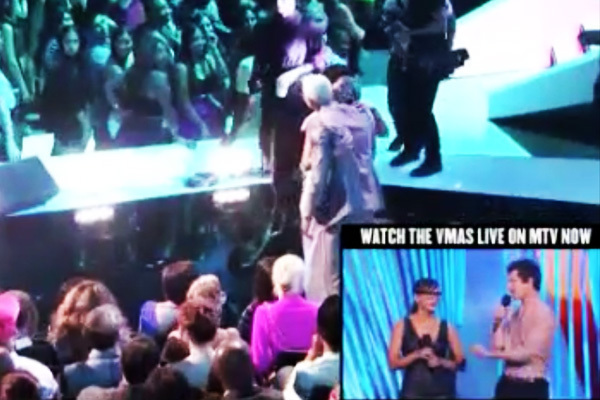 She goes back to her seat but on her way saw Mr. Breezy and took some time to hug him. It was a mutual embrace and a shocker! Although of course this is not the first that they are seen together again after the much publicized break up. After giving a quick embrace to Chris’s seat mate, Rihanna tousles Chris’ newly bleached hair in a playful manner. But no word yet if they two met up after the show.